It’s been a productive summer in many ways. I’ve had a bit of extra time to work on knitted things, and in between bits of ‘real’ work and cat-sitting stints and Sock-Summit-ing, I’ve had the time to do some pattern design work behind the scenes. This is on the one hand, exciting and creative and fun and vaguely terrifying and all the normal things that designing is. On the other hand, I am rarely known for excelling at being patient, and waiting to announce things that have been in the works for a few months is enough to drive me just a little bit batty. Thankfully, I’m finally at a point where I can start showing you some of the things I’ve had in the works. Over the next few months, I’ll have the extreme pleasure of announcing no fewer than 4 and possibly up to 6 or 7 knitted patterns of my own design, in all sorts of garment styles and yarns. Some will be going into publications, others I am planning on self-publishing, and still others have been developed in collaboration with some wonderful Canadian dyers. The one I have to show you today fits into this last category, and is one I’ve been working on with the extremely talented Tanis of Tanis Fiber Arts. This is the Rendezvous Jacket. 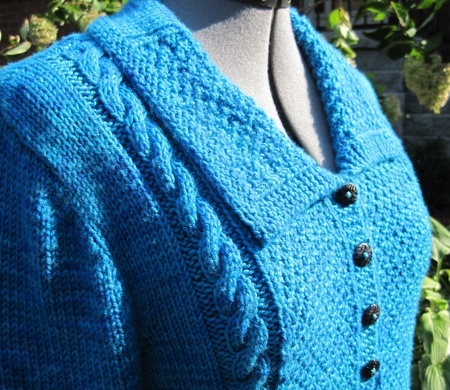 It uses Tanis’ Aran Weight yarn, and is shown here in the excuse-me-I’m-going-to-get-really-noticed-wearing-this ‘Peacock’ colourway. It is available for download purchase here in my Ravelry store online (this uses Paypal), and will also be sold in hard copy by Tanis herself after this weekend. The cost in both locations is $6.00, and the pattern comes fully formatted with a colour cover page, instructions for 6 sizes (35-50″ garment bust), and pattern schematic. Tanis will be taking the pattern (and the lovely sample) this weekend to the Kitchener-Waterloo Knitter’s Fair this coming Saturday, so if you’re planning on being there you can definitely stop by her booth and ponder it in person. When I planned this pattern I wanted it to fit somewhere in the category of a little bit classic, a little bit modern, a little bit casual. Because Tanis herself is going to be distributing this pattern in hard copy when she takes her yarn to fairs and shows, I wanted it to be able to fit with a wide range of skill sets and ages. 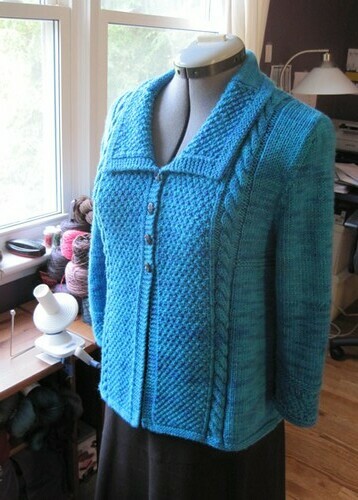 Aside from the two 6-stitch cables that frame the central panels, the entire pattern uses only knits and purls, increases and decreases, which means that even an adventurous beginner knitter should be able to take this on. Most importantly, I wanted to use a bit of texture. The jacket features a double-moss stitch panel on either side of the front, and down the centre of the back. This is matched by similar panels on the cuffs of the 3/4 length sleeves. Tanis’ yarns have a wonderful semi-solid tone and really need very little help showing off. Happy Wednesday! Keep the knitting close by. Oh how pretty! Congratulations on all the design jobs! Can’t wait to see your sweater at the fair!!! Wow… what a beautiful sweater. This has just risen to the “must make” list of projects I have. It is elegant and classy. I could wear this at work or out to dinner. Nice job! The more I read your blog; the more I would love to meet you! Looking forward to seeing your other designs. Lovely! 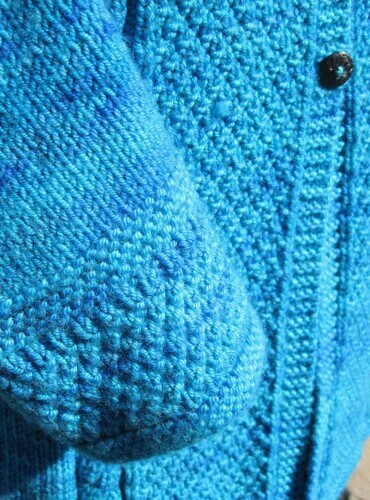 Since I’ve already made two of your sweaters with great success I’ll have to add this one to my queue as well! I’m going to buy the pattern right now! Great job! Amazing detail. Beautiful! And congrats – it is soo exciting, all of the new and super secret designs. That is a gorgeous sweater. Excellent work. I might just have to check out Tanis’ yarn, too. Too bad I’m so busy this time of year and Kitchener is such a trek for me. That fair sounds like a good idea. Very gorgeous! It takes guts to design something, and you are chock full of them! Looking forward to seeing it on Saturday! That is just gorgeous!! Congratulations on the new pattern (and yay!! more to come!)!! Love the sweater! Oh wow, it is wonderful. I’ll be at the fair on sat and can’t wait to see if in person. Yay Glenna! Thanks so much for designing this awesome jacket for me. I just love it and am having such a great time working with you. See you Saturday! oh wow, it’s awesome!! And I love Tanis’s yarns, they are brilliant. A perfect collaboration!! just gorgeous. what a lovely sweater! how exciting — can’t wait to see more of your designs. Congratulations on your new design – it looks great! The sweater is beautiful. I’ve been reading the Tanis blog for quite some time. You are really tempting me to try the yarn and sweater. This could possibly be the jacket I have been looking for. Very nice! Your design makes the yarn shine. Woot! Beautiful work! As always. 🙂 I can’t wait to see what else you have in store for us! The pattern is beautiful!! Way to go! I’m such a convert to Tanis’ yarns. I went from not owning any to having 2 sock and 2 lace weights in less than two months (that might not sound like much but I’m not a stasher). I look forward to seeing more of your designs! Congrats on the pattern partnership! Sounds like very exciting times ahead for you. How do we buy it on Ravelry? I can’t add it to my shopping cart? Let me know! I would like to purchase your Renezvous pattern. However, the site you mentioned is not selling it yet, and I do not have access to Ravelry, nor will I give them my money. Is there a way I can order it directly from you, or do you know when the other site will have it available. It is a lovely pattern. Thank You.